Some say that there are only two types of motorcycle riders – Those who have crashed, and those that are going to crash. Others have a similar saying regarding motorcycle theft. Just take a look at the comments in any online forum to see how common it is. 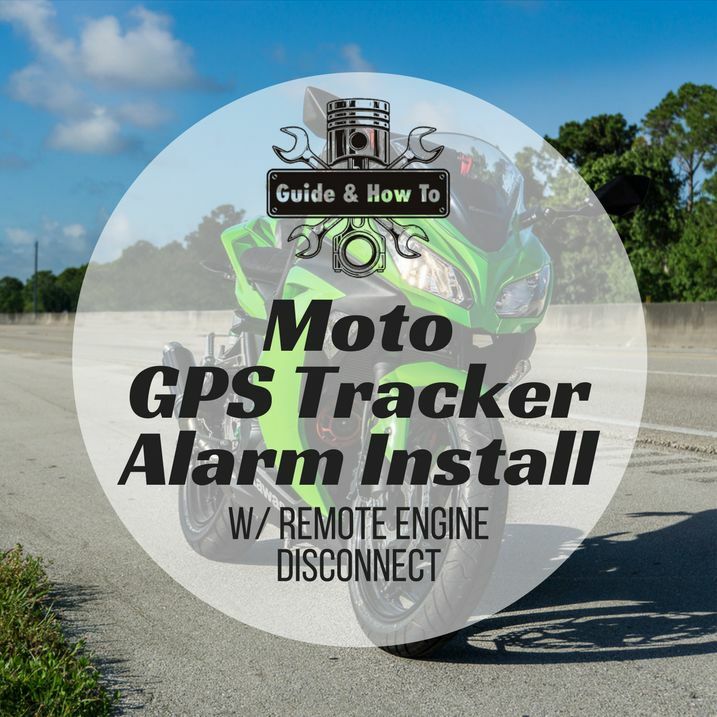 Here I’m going to go over in detail how to install a motorcycle GPS tracker alarm on a Kawasaki Ninja 300. Plus how to install it on other vehicles. I’ll also be upgrading the bike’s security with a decoy alarm and a remote engine kill switch. Here’s how. Simple Install – A few hours for some, a committed weekend project for most. Full Featured Install – 15-20 hours depending on your experience and the vehicle’s complexity. Just a note before we start. This project is definitely the most ambitious one I’ve taken on for this motorcycle. I can recognize it isn’t for everyone. If you’re looking for something a bit more bite-sized, see my Ninja 300 Project & Parts List. It’s a compilation of all the upgrades and accessories my bike has accumulated over time. If you’re looking for some inspiration or a few cool parts you might not have heard of, check it out. Should you install your own alarm? This article is actually just one component of the whole project. To make it easier to read I divided it up into different pieces. If you want to see the whole upgrade in order – which I recommend – here are the links. It’s a really comprehensive and interesting project, so you’re bound to learn something. Kawasaki Ninja 300 Alarm Install ⇐ Great, you’re already here! You don’t have to read them all if you’re only interested in one single topic. Or if you just want to learn. 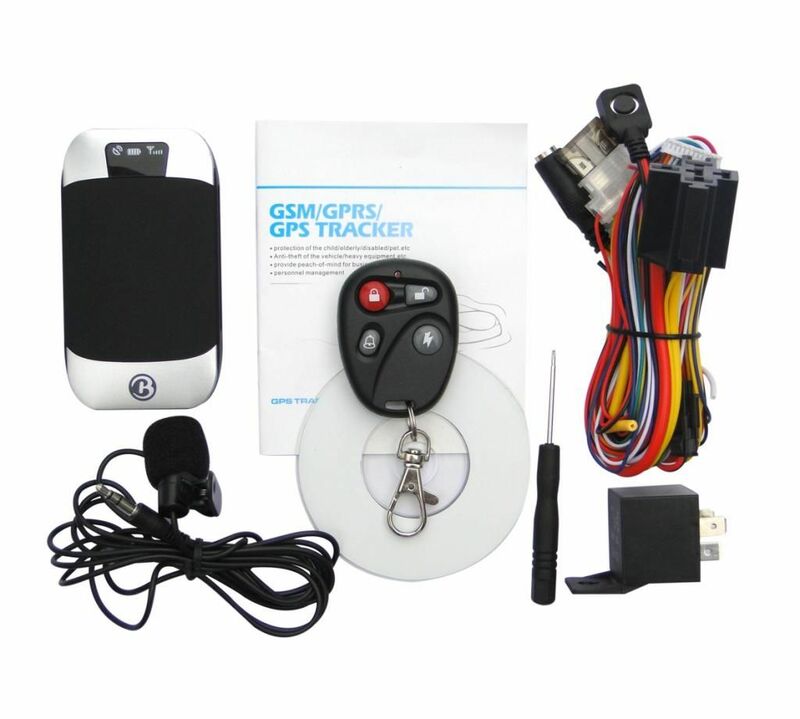 But if you’re in the process of installing a motorcycle alarm – especially if it’s a GPS tracker alarm – you’ll benefit from taking a look at them all before getting your hands dirty. I promise you won’t regret it. Though I’m doing this install on a Kawasaki Ninja 300, I’m going to purposely include more information that needed. Regardless of if you’re installing an alarm on your Yamaha, Honda, or anything else, you should find this handy. Or even if you’re trying to figure out the best way to add an alarm to your car. There’s a lot of general information as well as tips and tricks for alarm installs here. 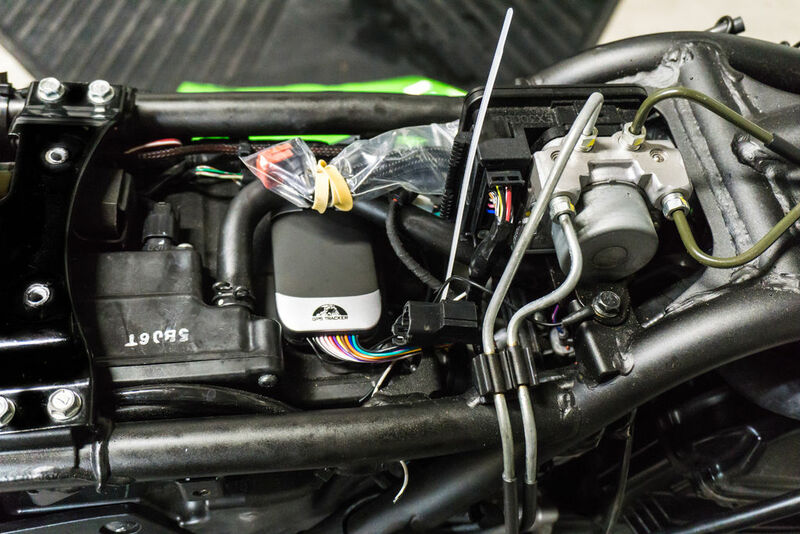 Installing one on your motorcycle is frustrating enough to have doubts in advance, so here I wanted to go over every little aspect in detail. Basically, I’m writing a summary of sorts with most of the information I’ve learned over the course of installing alarms over the years. In a way, I’m gathering the info that I would have liked to have available when I installed a GPS tracker for the first time. Since it’s longer than it has to be, feel free to jump over whatever doesn’t apply in your case. But I’ll be honest with you. Installing an alarm isn’t the easiest upgrade. Even being experienced in automotive and electronic work, installing a feature-packed alarm on modern cars is downright impossible these days. The electronics are way too complicated to do so without the car’s own electronics throwing a hissy-fit. Thankfully, motorcycles on the other hand are still somewhat accessible and simple enough to make installing an full-featured alarm feasible. For the moment at least. And given how motorcycles are much more prone to theft, it certainly is a project worth pulling off. Are you the type of person that likes DIYing? Would you know what is the normal voltage range for automotive batteries? Are you familiar with the resistance there is between your chassis and your battery’s negative terminal? At least ideally speaking. What about how to solder wires? Finally, do you have somewhere to leave the bike if this project takes more time than expected? If you’ve answered yes to all of those questions, or at least have a general grasp of all of them, then you should be able to pull off this job. However, let’s not kid ourselves. While this isn’t the most complicated project out there, it is very intimidating for anyone who hasn’t installed an alarm before. Or a few, for that matter. It isn’t intuitive, and it isn’t a fun process. 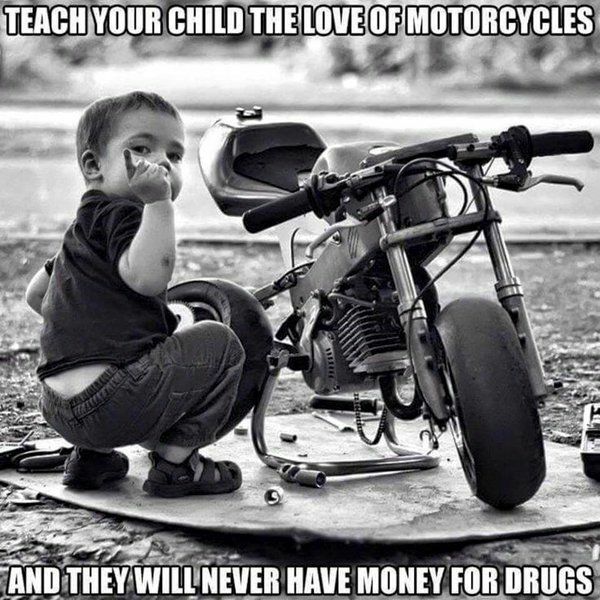 But once it’s done it’s rewarding – Or at least more rewarding than still paying for a loan on a bike that was stolen. That’s why I’m going to try to give all the details I reasonably can so anyone, anywhere, can install an alarm on any bike if they’ve got the motivation to do so. What you’ll need will depend greatly on what bike you have, what alarm you want and what features. Or simply your experience level and how you like to do things. I’m just going to list the components, tools and supplies I used. Simply in case it’s of any use to anyone who wants to take on this project. Items within parenthesis mean useful, but not essential. Personally, my current favorite alarm is the Coban GPS303G, also known as the TK303G. Don’t worry if it doesn’t say Coban – the rest are just “white-label” generic rebranded versions. They all seem to be the same. If you’re still deciding on this, checkout the different types of motorcycle alarms. Or my Coban GPS303G review for the nitty-gritty on that model. You’ll also need a few different components to get all the features working. 12v Piezoelectric Siren – I’ve tried several sirens, and I always keep coming back to this style. It’s loud, energy-efficient and compact. They’re also pretty water-resistant. You might want to take a look at 12v siren listings on eBay for other options. SIM Card – If you’re buying a GPS Tracker, regrettably you’ll need a SIM card. At least if you want to take advantage of all of its benefits. Currently the cheapest, prepaid option for SIM cards suitable for GPS Trackers is the SpeedTalk Mobile Prepaid SIM Card. Later I’ll explain why other options on the market won’t work. Of course, if you aren’t installing a GPS-equipped alarm this is unnecessary. A Normally Closed (NC) Reed Relay (or a suitable substitute) – If you want to make use of the remote engine-disconnect feature, you’ll need a relay. I’d highly recommend using a 12v NC Reed Relay with sufficient current capacity. One perfect example is the JWD-171-19 linked above, thanks to its low current draw. Multimeter – A staple in any automotive electrical project. I’m pretty satisfied with this one for jobs like this motorcycle GPS tracker alarm install. Flush Cut Pliers – Essential for any electronics work. I always have a pair lying around somewhere. It sure beats cutting pliers hands-down. Specially with delicate wires. Ratcheting Terminal Crimper – This is a must-have for quality automotive electrical work. It’s the best way to crimp terminals. If you get one, make sure it includes multiple jaws. The one I used (albeit a little more expensive – but worth it) is this one. If you want to see more info on this topic, check my crimping guide. Soldering Iron – For “on vehicle” work where I can’t use my soldering station, I really like this unit. Mostly because of the long cable, adjustable temperature, and On-Off switch. For anything I can bring to my bench, I always use a 898D+ soldering station. Regardless, any soldering iron you already have lying around should do fine. Wire Stripper – I use an automatic wire stripper like this one. It makes working quickly and consistently a whole lot easier. Simpler models like this Irwin Wire Stripper/Crimper/Cutter will also do fine, of course. (Glue Gun) – I used it to add weight to the decoy alarm. If you don’t intend to install one, it won’t be necessary. Unless that’s how you want to attach the GPS tracker alarm to the bike. Hobby Knife – This is used to strip fine wires that require a delicate touch. (Liquid Electrical Tape) – Use this if you really want to help make the bare stripped wires corrosion and humidity resistant. 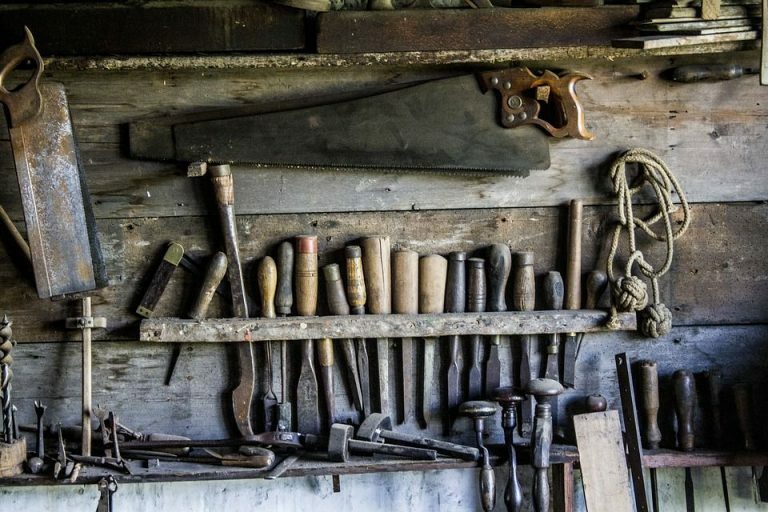 It’s a great thing to have in your tool box. On vehicles, I use it on all soldered wires or bare connections these days. Pro tip: Toothpicks are the best application tool. (Adhesive Heat Shrink) – Wire corrosion on motorcycles is still a big issue. The adhesive heatshrink helps seal the cable. 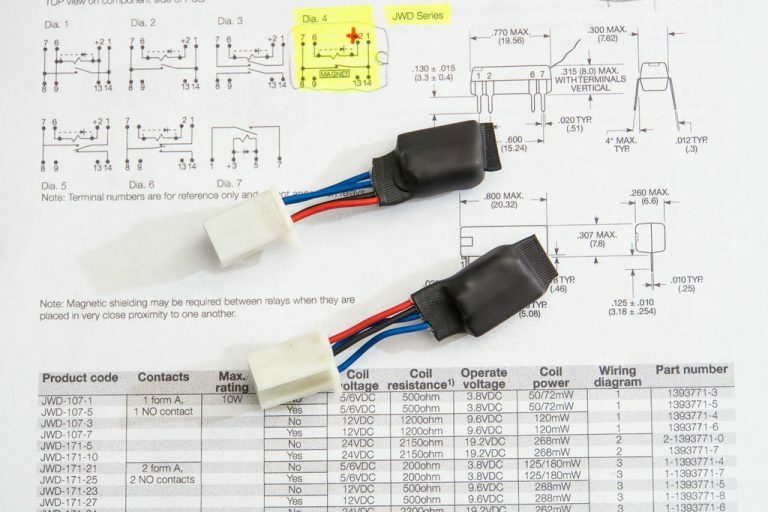 (Electrical Connectors) – To simplify the reed relay install for the kill switch. (16 Pin IC Socket) – Only needed if you’re using the reed relay for the remote engine kill. It makes the relay replaceable if it ever breaks. Plus it makes damaging the chip a lot less likely during soldering. (Dielectric Grease) – Used to protect the electrical connections from humidity. Put a dab in all the electrical connectors for maximum corrosion-resistance. There are a bunch of different alarm types. Make sure you pick the right model. 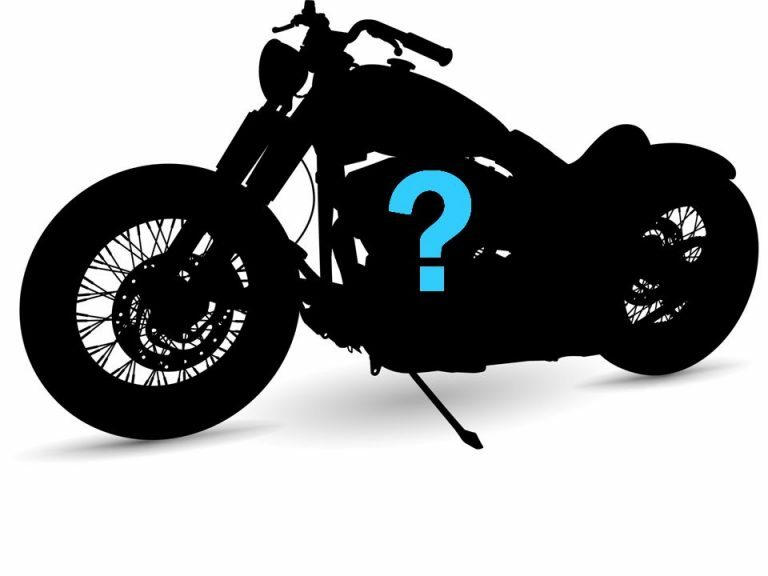 There are many different types of motorcycle security system options. Here I’ll be installing a Coban GPS303G, which is a 2-in-1 GPS tracker and alarm. Regardless, I also wrote a detailed guide on motorcycle alarm types for this project. Just in case you’re interested. In it I distinguish the alarms by “levels”, pointing out the advantages and disadvantages of each type. If you still haven’t decided what type of vehicle alarm you’d like, it’s worth the read. This is the ubiquitous Coban GPS Tracker Alarm GPS303G / TK303G. It’s my favorite motorcycle GPS tracker alarm as of now, and it’s great for cars, too. I’ve tried a lot of motorcycle alarms over the years. From simple alarms that do nothing more than beep when moved, to 2-way alarms that verbally warn you if you touch the bike. Truth be told, no alarm is perfect, but as of right now the Coban GPS303G is my go-to alarm. It’s cheap, function-packed and it works. If you want to see a full guide on all of its features and functions, check out my Coban GPS303G GPS Tracker Alarm Review. In either case, that’s the alarm I’ll be installing in this how-to guide. This is the finished remote engine kill-switch relay device. You only need one. I just made a spare in case. 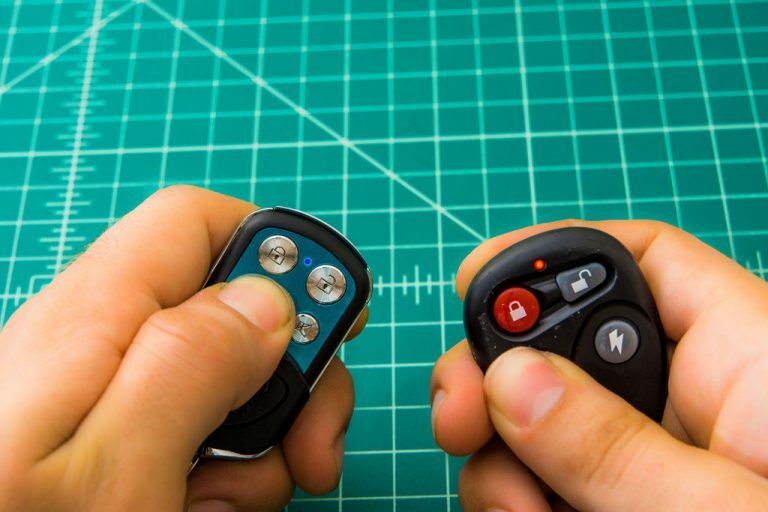 Initially this DIY included both the theory and the practical side of how to put together a motorcycle kill switch circuit. However, it’s interesting enough to warrant its own article – so that’s what I did. Once you’re done reading that – if you intend to install a kill switch at all – come back and keep reading. Use the screwdriver supplied with the GPS tracker alarm to avoid scraping off the silver finish. Before beginning the alarm install on your motorcycle, you’re going to want to do a few things first. You might as well do them now. If you still have the power supply out from the reed relay testing, you might as well charge the internal battery on the GPS tracker now. Simply flip the switch inside the tracker – to connect the tracker to battery power – and hook-up the positive and negative wires (check the diagram) to a 12v power source. The middle LED indicator will turn from “red” to “off” once it’s charged. That might take an hour or two. Then you’ll want to flip the switch off again for the time being. Next, you are going to need a working SIM card. That is, at least if you want to be able to both send and receive messages to and from your bike. One quirk this alarm has is that it was obviously designed years ago, and as such it only works on 2G networks. Given that it’s just a semi-sophisticated car alarm, that normally wouldn’t be an issue. However, the problem is that almost no mobile operators in the USA today (September 2017) work on 2G networks any more. In other words, if you use a 3G card from AT&T or T-Mobile, your alarm isn’t gonna get a signal. It just won’t work. Thankfully, there are still 2G prepaid SIM card available. Today, the cheapest card that I know of that works on 2G networks is the SpeedTalk Mobile Prepaid GSM SIM Card. There’s no contract. It’s just a prepaid, pay-as-you-go card. You can buy it for under 10$, and it will come preloaded with 5$ credit. You can register the card online after your receive it and use it immediately. The cheapest it will cost you monthly is 5$, and not because you will be using up that whole amount. The issue is that you have to add (at least) 5$ credit each month to keep your account active. But that still means only 60$ a year to track your motorcycle, which is as cheap as it comes. If you set up the Auto-Refill feature, you won’t have to look at it again. For reference, I tend to only use 2-3$ of credit a month. The rest of the credit simply expires before I ever need it. 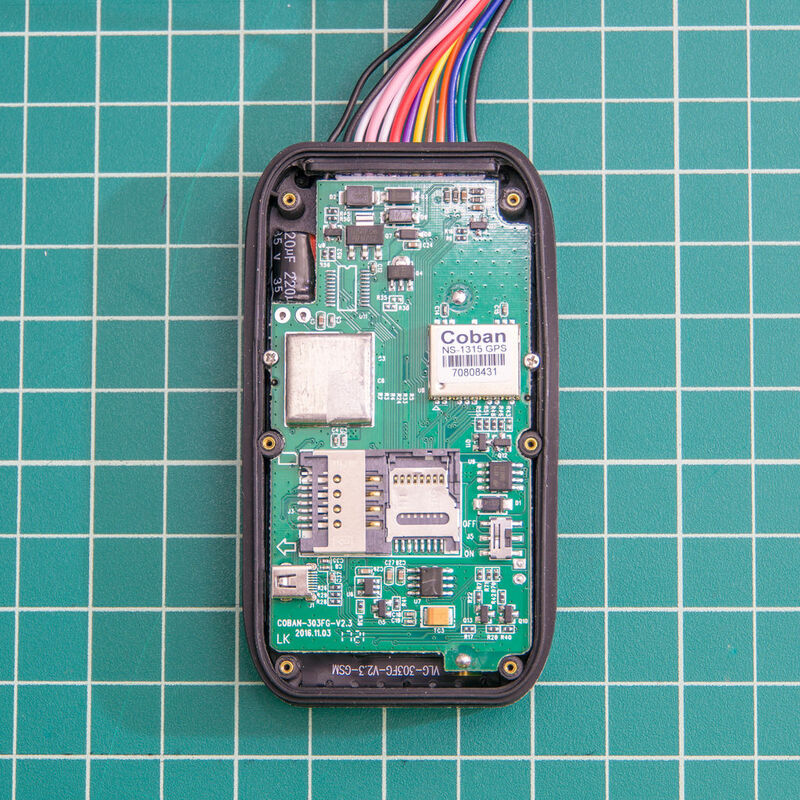 Regardless of the “brand” of your GPS Tracker, you’ll probably see a Coban label here. Once you’ve bought and activated the SIM card, install it. You just have to unscrew the back cover with the supplied screwdriver to put it in. While you’re at it, you might wanna consider filling in the MicroSD Card slot. I probably wouldn’t bother buying a card for this purpose – though there are cheap cards available. However, the thing is that you probably have some 1, 2, or 4GB MicroSD Card that’s been lying around for years in a drawer somewhere. If you do, this is a good opportunity to put it to use. As I understand it, the function of the SD Card is simply to log the location of the vehicle, though I’ve never gotten around to using it for anything. 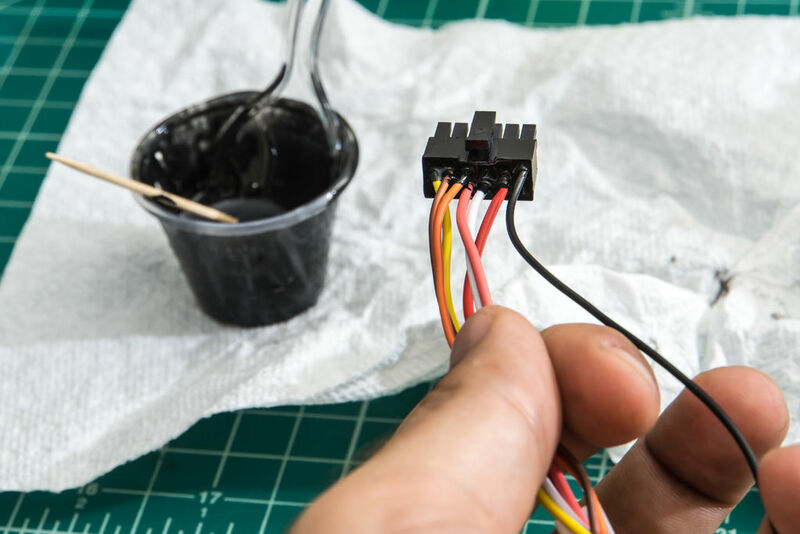 After pushing out all the wires you won’t be using, consider sealing the connector with some epoxy or liquid electrical tape to make sure no water gets into the connections. Next, you’ll want to decide which wires you’ll be using, and which you won’t. Remove the wires that you have no need for. I personally pushed the pins out from the plug (if you do this, be very careful), and then used some epoxy (from when I was encapsulating the reed relay) to seal the plug against water or debris. You can also remove the Remote Engine Disconnect (Yellow) if you won’t be using that feature. This leaves you with just a few wires to connect, which isn’t all that bad. This only applies if you want to install the GPS tracker microphone. It lets you call the alarm and hear what’s around your bike. I guess it could come in handy if the motorcycle is ever stolen. If so, you might want to shorten the microphone wire to the “proper” length for your install. In my case I needed around 6 inches, not 4 or 5 feet. Simply shorten it and add a new 3.5mm plug. Or cut the wire and re-attach the original 3.5mm plug. The red wire from the microphone goes to the ring, and the green wire to the tip, if I recall correctly. You should then measure an open-circuit between both red and green wires once the plug is added. Just use a multimeter on continuity mode. That way you’ll make sure you didn’t short-circuit the connections while soldering. Now that that’s taken care of, let’s proceed. Now the real work on the motorcycle begins! Sorry for having taken so long on the intro, but staging the project is often the most important part. It avoid a lot of trouble later on. Prop up to the rear tab on the gas tank so you can disconnect the connections underneath it easier. Cover the fuel line with some plastic and a rubber band to keep junk from getting in. 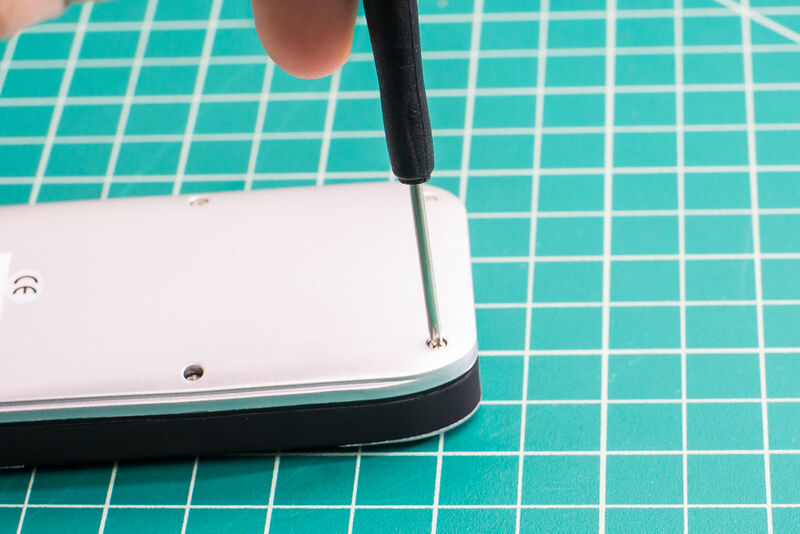 The first step is to gain access to the battery area. It’s located under the seat. Remove the side panels and front seat to begin. Then remove the two bolts holding the gas tank with a 10mm socket. Lift that tab up and place a 2″ block of wood (or something equivalent) to prop it up. 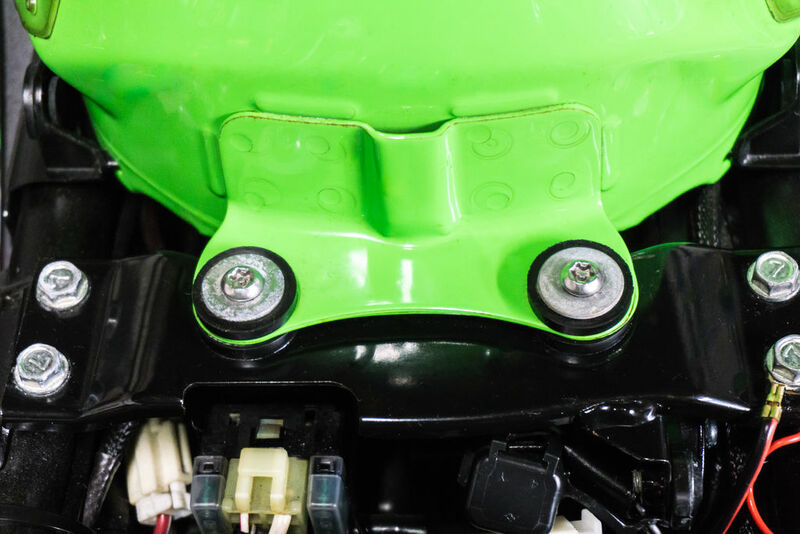 Next, disconnect the Fuel Line – just pull up the tab with a screwdriver – and the fuel pump connection (lift a tiny tab). It might get tricky to unplug, but it’s not hard. You’ll also want to disconnect the gas tank vent line on the left side. Finally, once you’ve done that, simply pull the tank out pulling back and up. You can do it now, or later, your choice. Put some double-sided tape on the GPS Tracker and stick the alarm in place. A good spot is on top of the air box as pictured. Also, always use adhesion primer where it’s hot and humid, like a bike. The other choice is to attach it with Heavy Duty Velcro. It’s better to use velcro since it’s not permanent. If you go with double-sided tape it’s extra important to make sure you inserted the SIM and turned on the switch inside the GPS Tracker before sticking it in place. These are the cables we’re interested in. The next step is to connect your GPS tracker alarm to a power source. On this bike, the easy choice was to wire the main power wires for the GPS alarm directly to the adjacent ABS Pump. So that’s what I did. Double-check your wiring, but I intended to connect the +12v Power Wire to the big Red wire on the ABS Pump Electrical Connector, and the ACC wire (+12v on Ignition) to the Brown/White Wire. The electrical diagram is attached below. One tip to help identify the wires on the ABS pug connector is to stick a sewing pin or needle in the connector on the front side so you can test your multimeter probe on it. It’s useful where you can’t insert the multimeter probe tip directly like here. This is the pin layout for the ABS pump connector. These are the colors that correspond to the wires for the different pins on the ABS pump unit. Make the connection to power the alarm (+12v always) on the big fat Red Cable with the White Stripe. Connect the ACC wire (+12v Power only on ignition) to the Brown Wire with the White stripe. You don’t have to cut the wires. Simply remove a bit of insulation and tap into them. 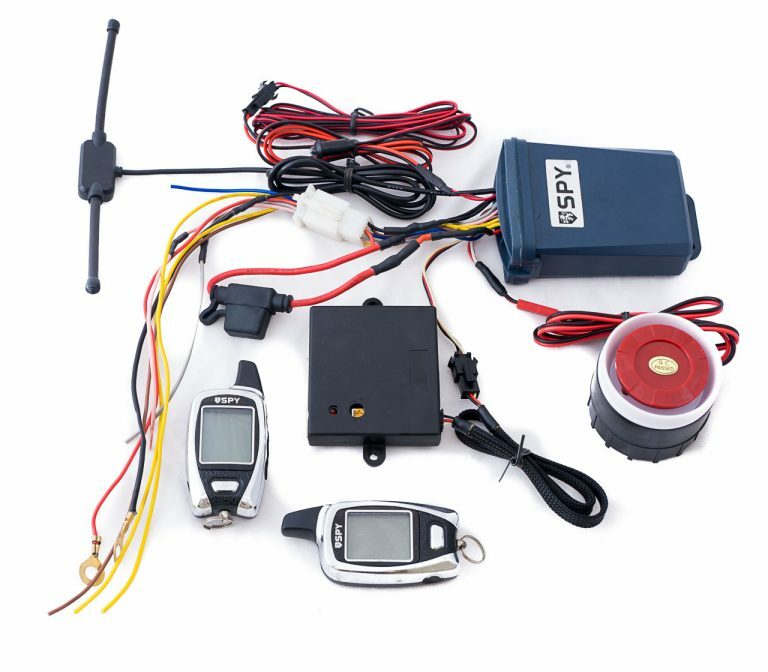 Once you’ve identified the right wires to power the GPS tracker alarm, connect them to continue the install. I like stripping a 1cm section of insulation and sticking an X-acto Knife between the wire strands to separate them into to bunches. Then I’ll stick the stripped wire I want to connect through the middle, and finally wrap the incoming wire around the wire I’m tapping into. Bonus points if you use liquid electrical tape to waterproof the connection. Then just wrap it with electrical tape. Regrettably you can’t use heatshrink here. Keep in mind that you don’t have to cut the wires leading to the ABS pump. Simply remove a bit of insulation and connect the wire to it. 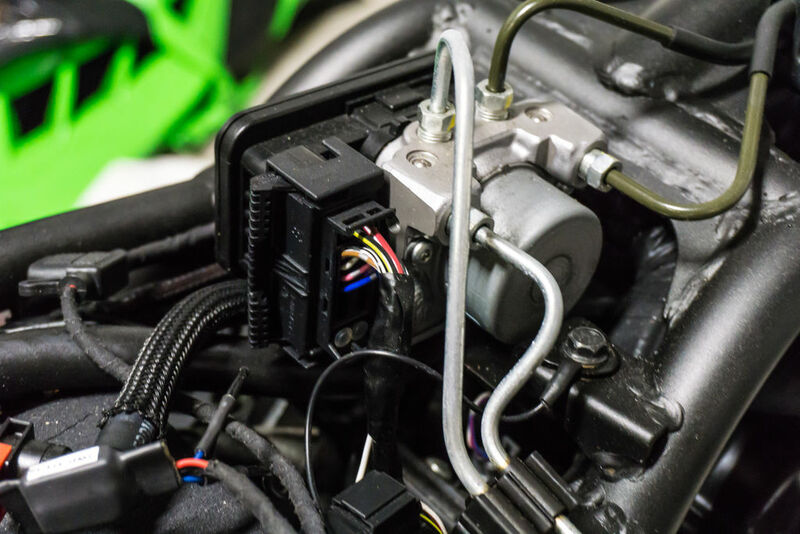 One benefit of wiring it to the ABS Pump connector is that, as long as the bike’s main battery leads are connected, the alarm is receiving power. This means that a thief can’t selectively disconnect the alarm while still making the bike capable of starting. That as opposed to wiring the GPS tracker alarm directly to the battery terminals, where it could be easily disconnected. Finally, I added a waterproof mini fuse holder instead of the non-waterproof fuse holder that came with the alarm. I’d recommend you do the same for water-protection. But if not, at the very least wrap it with some electrical tape and squirt a bit of dielectric grease in. What if my model doesn’t have ABS? Oh. In that case look around for any power-carrying wires and check its voltage to see if it’s suitable. The ignition wires are a good option. There are power wires everywhere so eventually you’ll find one that serves you. Use this bolt to ground the alarm. Once you’ve finished making the connections, wrap it tightly in electrical tape. The trick is to stretch the tape on. Don’t just wrap it. Stretch it on. After a while it will lose it’s sheen and look like a discrete OEM wrap. Once that’s done, install the ground wire. I simply attached it to the bolt on the ABS pump bracket. Make sure to remove some paint first, to have a good connection to ground. If you want to install the microphone, just run it into the front headlight housing. Or near the ignition switch. Somewhere semi-exposed but protected from water spray. That way you can listen to what’s happening around your bike if it get’s stolen and you’re about to find it. I admit it’s not a feature I’d pay for. But given that the alarm includes the microphone, it’s worth having. At this point the alarm should be working already. Just to make sure – and for a moral boost – test it. Temporarily connect the alarm siren, to see if it sounds when you arm and disarm the bike with the remote. Try turning on and off the ignition to see if it detects it. You’ll see it via text messages the bike alarm sends you. Send “Check123456” to the SIM card’s number to receive the status of the bike, etc. Play around with it. And if you’re confused about how the GPS tracker commands work, check the manual. But, what if you’re not installing this alarm on the same model bike as the Kawasaki Ninja 300 ABS shown above? If you’ve never installed an alarm before, it’s daunting. I’ll be the first to admit it. Especially if you aren’t experienced in electronic or electrical work. If someone isn’t telling you exactly which wire to connect where, it will feel like an impossible task. I can’t tell you how to install an alarm on your bike, but I can give you a few tips. If you haven’t ever installed an alarm before, I probably wouldn’t recommend installing the engine disconnect. Especially if all of this already makes you feel like a fish outta wire. It may be more trouble than it’s worth in such a case. Though it’s not hard, if you’re feeling up to it. Install the black (negative cable) either directly to any bolt on the chassis. Or directly to the negative terminal to the battery. Keep in mind that the whole chassis of the vehicle is “0v”. Essentially, the bike’s frame is a huge wire connected to the negative terminal of the battery. Once you’ve connected ground, it’s one cable less. Next, start considering which alarm power wires you want to install and where to hook them up. The two “power” wires are ACC (accessory power) and main alarm power. You can connect, or leave disconnected the ACC wire. It’s only purpose is to let the alarm know that someone has turned on the bike – including you. With it, if the alarm is armed, the siren will go off if you turn on the ignition switch. This will happen to you every so often when you forget to disarm the alarm before starting the bike. If you do want to connect it, simply probe around your bike until you find a wire that is 12v with the bike on, and 0v with the bike off.To do that, put the red probe from your multimeter on the wire you’re testing. Then touch the black probe on any bare metal on the chassis, like a shiny bolt head. Once you’ve found it, connect the ACC wire there. For the Coban GPS303G it’s the white wire. Next, install the red +12v wire. It’s the main power wire for the GPS tracker. You can connect it to the 12v terminal on the battery or to any 12v power wire you find around the bike. Look for thicker-than-average wires, since that tends to mean it’s a current carrying wire. In other words, that chances are it can cope with added current. Follow the wire to make sure it’s going to some big component that won’t mind the extra load. Some options are the ignition cable, the ABS Pump, the Fuel Pump, the Headlight, etc. To connect the siren, first connect the black wire coming out of it to ground (0v). Any place where you could have connected the black negative cable will suffice. Then, connect the red wire coming out of the siren to the pink wire coming out of the alarm. This is the Decoy Alarm – a real 12v motorcycle alarm which has been gutted, rewired, and weighted. That way they’ll unplug this (inadvertently disconnecting the siren) while still leaving the GPS tracker fully functional. On the 2015 Kawasaki Ninja 300 ABS, I installed a Decoy Alarm that goes tucked vertically in this little space. It can still be pulled out or disconnected tool free, which is what you want. The point of the Decoy Alarm is for the thief to disconnect it and not look for the GPS Tracker (which is the real alarm). You can’t really tell here, but the Dummy alarm is right there. When theft happens, having a GPS Tracker on your bike is definitely a worthwhile advantage. However, the point is moot if your friendly neighborhood thief rips out the GPS tracker and smashes it with a hammer shortly after stealing your bike. An alarm siren absolutely makes a bike harder to steal unnoticed. But it does guarantee that the first thing the thief is going to do is pull out that alarm. If that alarm is also a GPS Tracker, that’s a problem. At least if you want to keep receiving GPS coordinates from the stolen bike. At this point, if you want to decrease that risk you have two options. The first is installing a discrete GPS tracker alongside a standalone alarm. Presuming they simply won’t find the GPS Tracker. There are a lot of downsides to that, one of the biggest being double the drain on a tiny motorcycle battery. The better option is installing a decoy alarm, and wiring the GPS Tracker siren through it. This is my favorite choice. Plus, it’s just plain cool. 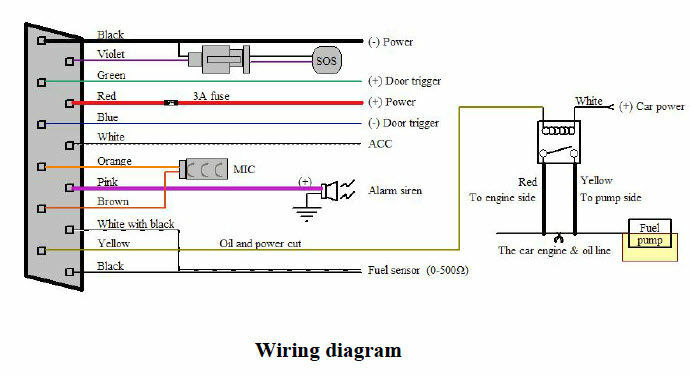 Using the diagram above you can see the wiring diagram on how to wire a decoy alarm to your GPS Tracker alarm. It’s a pretty trivial setup. Installed this way, if the decoy alarm is removed, the GPS Tracker still remains connected to the vehicle’s battery. And as such, reporting GPS coordinates. But when someone removes the dummy alarm, the siren is deactivated and will no longer work. The point of this is giving the thief the instant gratification of thinking he’s removed the alarm. While not actually removing or disconnect the real GPS tracker alarm installed elsewhere. Not to mention stopping disassembly there, at least for the meantime. This is the kickstand switch connector. It’s located just above the front sprocket. This is the wiring for the Kickstand Switch. In plain English, to simulate the kickstand being down (and hence kill the engine) all you need to do is “cut” the wire (“Open” the switch). Simply leave the Reed Relay tucked off to a side next to the GPS Tracker under the gas tank. If you can, put a dab of dielectric grease in the connector to fend off the electrical demons. If you want, you can wrap it with electrical tape too so it’s more discrete and protected. If you intend to install this, hopefully you’ve already checked out the remote engine disconnect how-to. After all that’s done, now the work left is pretty simple. Find the kickstand switch. On the 2015 Kawasaki Ninja 300 ABS it’s on the left side, above the front sprocket. In the picture, it’s the plug with two wires: one green and one black. Then wire the two blue wires from the Reed Relay inline with the Kickstand switch. Finally, test it out. Lift the bike up on a rear stand and put it into first gear. The rear wheel should be spinning in the air. Then send the message “stop123456” to the GPS tracker alarm’s phone number. In other words, the SIM card’s phone number. The engine should cut off after a few minutes. Then send “resume123456” to re-enable the engine. Hopefully it worked. Cool, huh? Install the siren for the alarm under the tank on the right side as seen here. You will definitely have to use Adhesion Primer (see “What You’ll Need” step) and a quality double-sided tape. Pass the wire for the alarm from either the Decoy Alarm (detailed in a another step) or the GPS Tracker Alarm. I hid it better than is pictured in this image. Zip tie it down a long the way if you can. Once you’ve made sure everything works properly, install the gas tank connections again. Then tape the alarm siren in place with quality double-sided tape. Oh, and don’t forget to reinstall the tube on the left side of the gas tank. By the way, be smart and remove the original white foam double-sided tape from the alarm – It’s junk. It always ends up falling off. Hopefully before you’ve reassembled the bike. Remove the original tape and install some quality double-sided tape using an adhesion promoter. I personally like 3M’s Heavy Duty Outdoors Tape for jobs like this. Finally, apply the adhesion promoter to the underside of the gas tank and install the siren there. See the pictures and you’ll notice exactly where I installed it. The only two bolts that hold on the Gas Tank are these – two M6x1.0mm, L: 30mm bolts. One more thing you can do to tip the odds in your favor is to install I-Torx bolts on the gas tank. I mean those little funky starry allen keys with the pin in the center. They aren’t all that hard to defeat, true. But they certainly will take time, tools and effort to do so. All of which give you more time to track down that bike. I really recommend replacing the normal gas tank bolts I-Torx M6/30mm Security bolts, as pictured. It’s the type that has a pin in the center, so you can’t just use an Allen key. It will certainly take your average thief some extra time to take them off. And that’s extra time for you to track the bike. 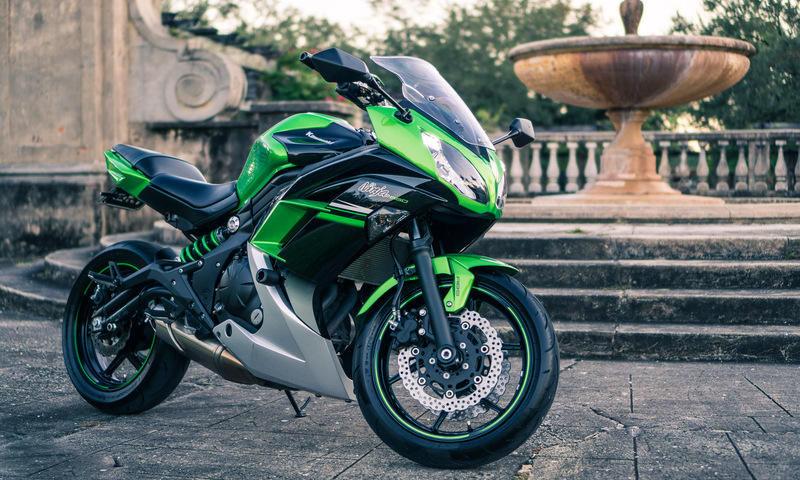 For the 2015 Kawasaki Ninja 300, you’ll need two M6x1.0mm, L: 30mm bolts, to replace the original ones. Ideally stainless steel for corrosion resistance. For under 5$ to upgrade security, it’s worthwhile. This goes for both “normal” and GPS alarms, but double for GPS alarms with dummy Alarms. You want any thief to have as hard a time as possible disassembling the bike any further. You’ll definitely want to purchase a spare remote for this alarm. The unit only comes with one remote, and if you’ve lost it, you’ll have no other choice but to replace the whole alarm. The Coban GPS303G alarm installed here only comes with one remote. If you lose it, you’ll have no recourse but to buy a whole new unit with a new remote. I highly suggest getting your hands on an extra remote or two, before you need it. Just keep the original remote as a spare. Test the alarm to make sure it works properly. Now comes the step where you ride off into the sunset with a Nickelback song playing in the background. Cue End Credits. All done. Finally! I bet you can count with both hands how many people have made it this far. If you’re one of them, congratulations! Really. You deserve it. Hey! Check out this post. It’s all explained in here – Remote Engine Shut-Off Device for Motorcycle. Pay extra attention to the part that talks about the kickstand switch. Hey man, thank you for this DIY, nice work! Just a quick question ! I installed the tracker (303g) and I can’t arm it because of door on message(set up fail! pls close the door). I removed both cables before installation, green and blue as you did. How can I switch it off so the alarm can be armed? Any thoughts ? Glad you found it of use! I’ve never received that error message, though I’ve never tried using the door feature, either. But it definitely looks like that’s related to the blue and green wires. Are you sure they are insulated and not touching anything? I’d imagine that message would be received if green was connected to +12v or blue to ground/0v. If that isn’t the case, I’d put my money on it just being bad luck that you received a defective unit. If so, I’d contact the seller for a replacement and wouldn’t invest more time in trying to troubleshoot it. Yes man, actually I ripped them both off the harness before installation. The harness now has only 4 cables (12v, 0v, ACC and siren). Also, on my bike I have connected only 12v and 0v for now, because simply I cannot use the tracker for any kind of alarm due to the constant “not armed” status. As long as it reads “door open” it just cannot be armed… Weird things!!! Hey! If you wired it up correctly, send the text message “stop123456” (or whatever your password is) to the alarm’s phone number. I don’t recall if you can cut it off from the remote directly, but that wouldn’t be the way you’d want to cut the engine in the real world anyway. Hope that helps. -While it should work either way, how you’ll be triggering the reed relay is “connecting/disconnecting” ground. The reed relay will always be connected to +12v while the bike is on. – Yeah that sounds about right. The LED should be working wired to the reed relay like that, and when you “activate” the reed relay, the LED should turn off. Hey love this DIY and your site! Quick question, did you end up discarding the entire oil and power cut that the 303g comes with? I guess what I’m asking is how did you connect your (reed) relay killswitch to the actual GPS device. Did you delete the relay that comes in the box and just solder your (reed) relay to the yellow wire coming out of the unit? Thanks. – Did you end up discarding the entire oil and power cut that the 303g comes with? – Yup. I just kept it as a spare for future projects. You could use it as a direct replacement for the reed relay. It’s just that the reed relay’s current draw is a fraction of that of the normal relay. I’m a bit OCD but efficiency on motorcycles, given the small battery. – Did you delete the relay that comes in the box and just solder your (reed) relay to the yellow wire coming out of the unit? – Yup, that’s exactly what I did. If the reed relay has 4 wires (12v, Ground, switched wire in, switched wire out), I connected one of the wires directly to 12v (if I recall right), and the other to the wire that initially fed the relay that came with the 303G. Which relay do you have? Is it the same part number? Taking a quick look at it, that wiring looks fine. To test it you have to wire pins 8 and 14 in line with a small +12v LED bulb. With only pins 8 and 14 connected, the bulb should stay lit. If you also connect +12v to pin 2, it should still stay lit. If it’s working correctly the bulb will turn off if you then connect pin 6 to the same ground as the LED bulb. Then the bulb should turn off. If that isn’t clear, let me know. It’s a bit counter-intuitive at the beginning. Yes it’s the same relay that you have. Also, checking continuity across the relay, should 8 and 14 have continuity with no power to pin 2? When you say 12v LED bulb, I’m assuming that means that there is supplied power to the led bulb, correct? I’m working with a basic breadboard kit and basic electronic skill so I apologize for peppering you. – Yup, #8 and #14 should have continuity even if all the other pins are disconnected. That makes the relay much less likely to give trouble since the relay normally acts as if it weren’t there. – Yup. What the relay does is disconnect the glowing LED bulb. It’s not supposed to make it turn on, it’s supposed to temporarily make it turn off.